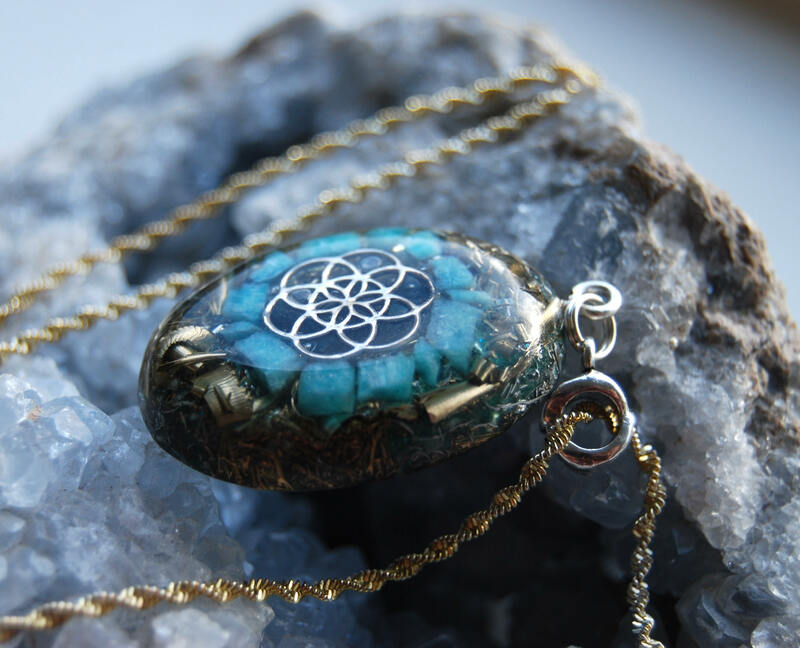 This lovely Orgonite® pendant contains aluminium, bronzes copper and brass shavings. 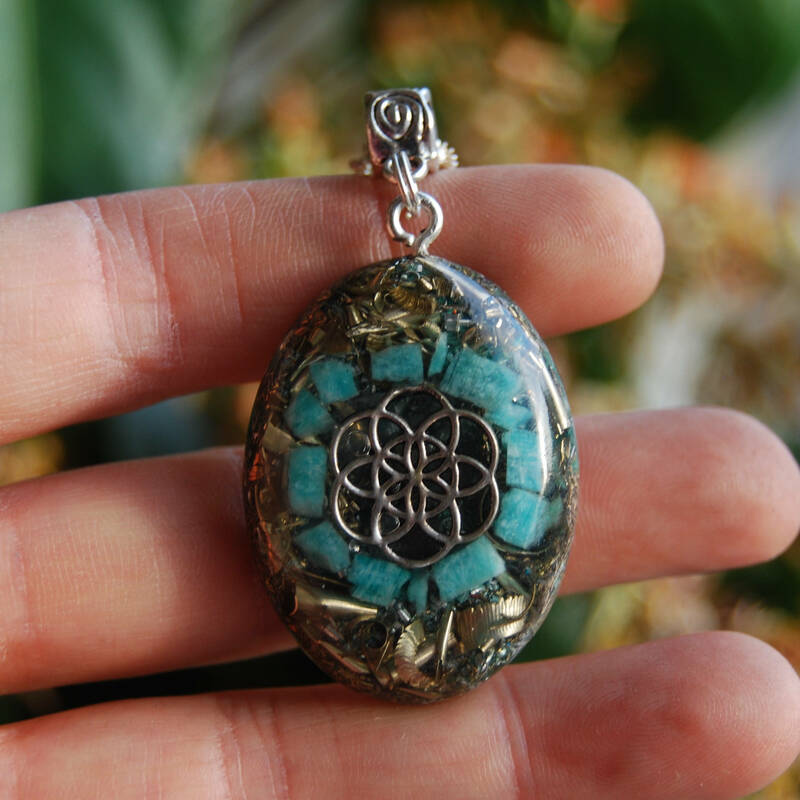 It also contains Amazonite (front), Pyrite (to enhance the overall strength of the piece), Rhodizite (to amplify the stones), black Tourmaline (to ground and protect), Selenite (to charge and clean) and clear Quartz (for piezo electric effect) all within a durable resin setting. 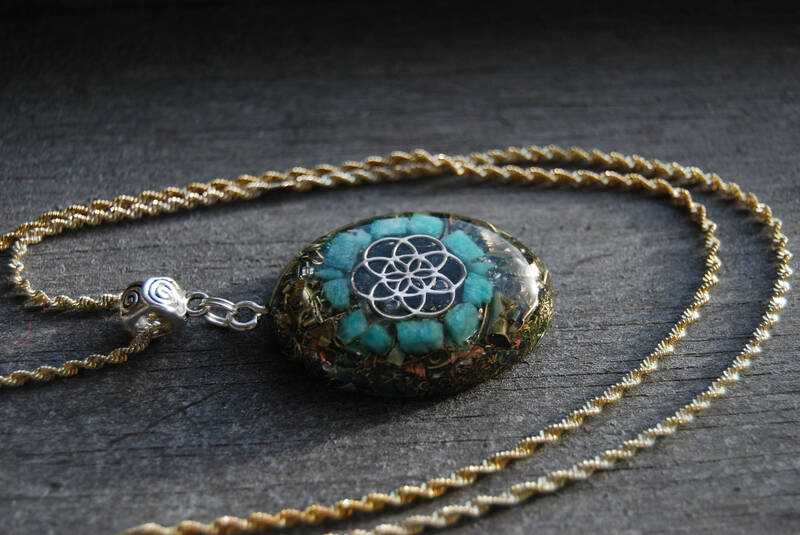 The Amazonite stones are carefully cut out of one bigger raw Amazonite stone and then layered around the Seed of Life. Seeds are magic, potent vessels of nature. They hold entire intelligent blueprints for life. They can lie dormant for ages before the conditions are ripe for them to burst into life. As a beautiful metaphor for consciousness, a seed represents the divine design within all things. All things existing can be built from the shape of the seed of life. The Seed of Life is formed from a relationship of 6 circles around one. Each circle fits into this pattern like a lock and key, forming a dynamic field of possible geometric relationships which reveal the most fundamental shapes of Creation. 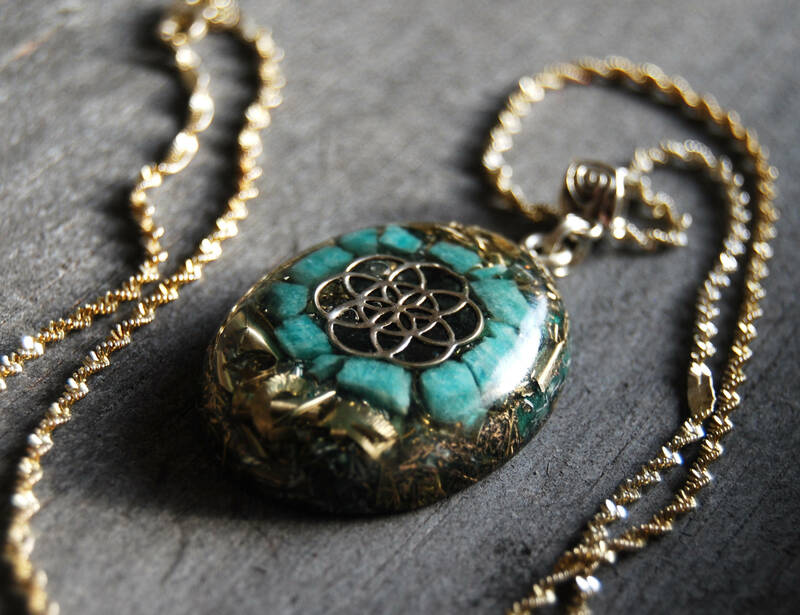 Amazonite carries a strong energy that is able to stimulate the better emotions and personality traits. 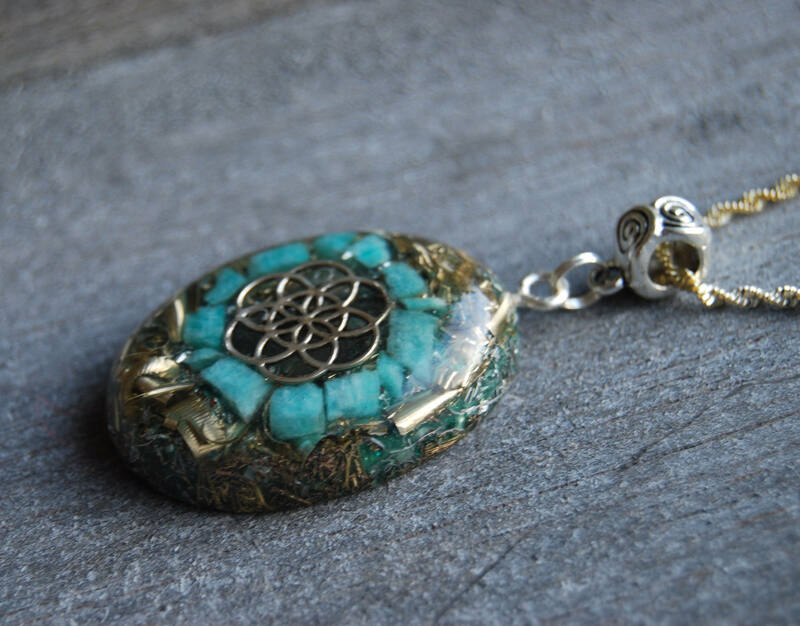 It is said to balance masculine and feminine energy, and strengthen physical power and stamina. 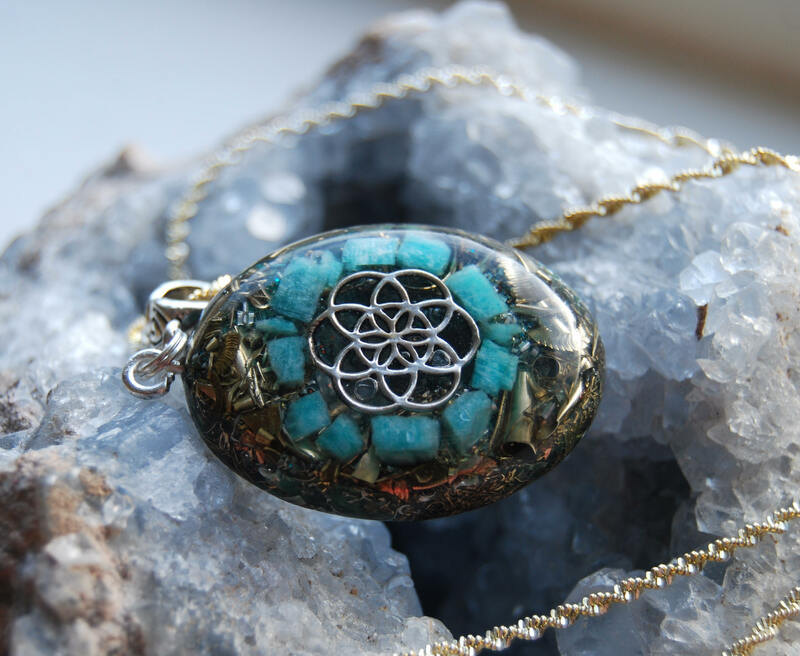 Amazonite is able to soothe all chakras, but if placed specifically on the heart or throat chakra, it can enhance communications concerning love in one's life. 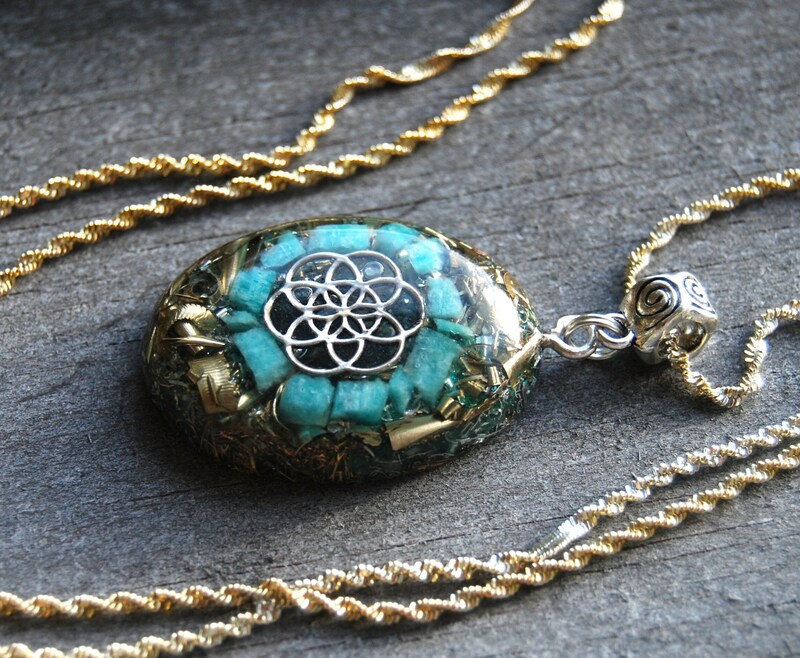 In addition, Amazonite stimulates artistic ability, creativity and the powers of clairvoyance in its wearer. 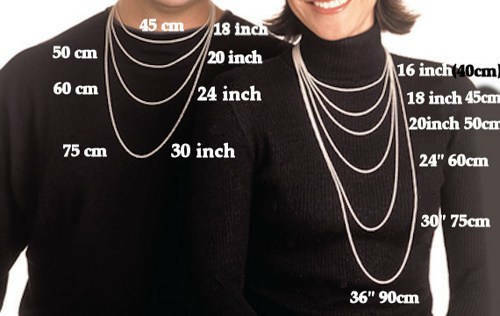 It comes on a 55 cm / 24 inch nickel and leadfree sterling silver coated chain with lobster clasp. In the last picture you see an example how it would like when worn.